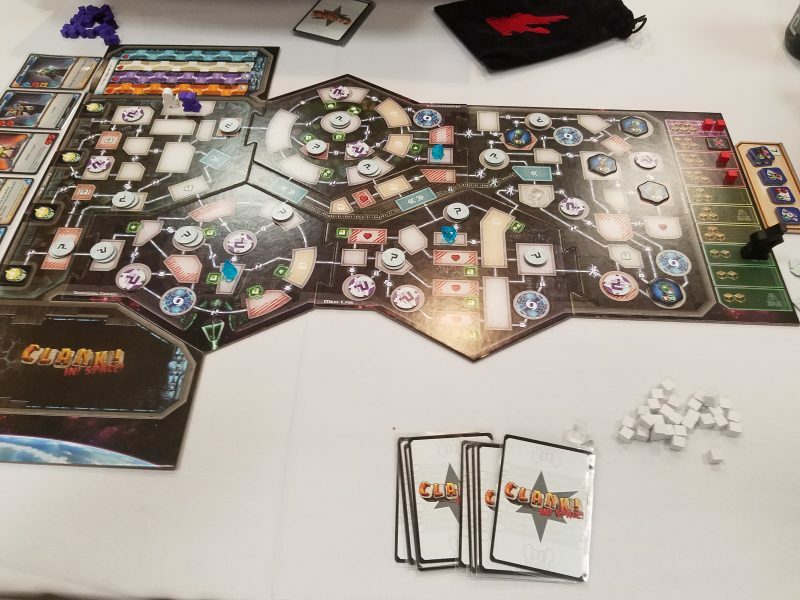 I just spent the weekend down in Connecticut at “Connclave” playing games non-stop. I know you’re all immensely jealous about that fact, so I’m here to spread the love. Here are some mini-reviews of every single game I played that was brand new to me. Nearly all of them were good, so warning: this might cause your wallet to lighten a bit. Time for some hot takes! Despite the unhealthy relationship this game has with exclamation points in its name, C!I!S! Is pretty fun. If you’ve played the original Clank! this is essentially the same thing. The board is modular, though in a limited way so that the artifacts are always on the far side of the map. The modularity involves three pieces of the map that can be flipped over. When I looked at them after the game they didn’t seem radically different, so that aspect of the game seems to be fairly benign. If you haven’t played the original, this is a deckbuilder with a map. You’re not only trying to get victory points and buying power, but also movement and attack power. The available cards are in a rotating display, which I think is inherently inferior to the Dominion method of a static card choice. But it works alright here as this plays a lot more casually than Dominion. The biggest draw is the push-your-luck dynamic to the game, because you can only score points if you get into the dungeon (space station?) and out before you’re killed by the monster (space monster?) inside. Certain cards will increase your “clank”, represented by cubes of your player color going into the mystery bag of doom. As the game progresses, more and more cubes will be drawn each time a certain trigger is activated, and if you don’t get out in time, you score no points at all. Plus, once someone escapes the danger escalates dramatically. Ultimately this game is merely pretty fun, and better in theory than it is in practice. The tension that comes with the meta-game of trying to get in and out and the random bag-pulls is great, but the deckbuilder part of it is lackluster. The cards are pretty dull for this genre, though there are a number of sci-fi in-jokes, and I can’t get past how the rotating display blocks any chance of strategic synergy with your cards except by happenstance. I couldn’t pass up a chance to play the most recent Spiel des Jahres winner, and even though I know that award is for family games, I was not prepared for how light Kingdomino was. It’s over in about 10 minutes and only has a handful of decisions. You’re constructing a 5×5 grid using domino-inspired cardboard tiles that are even more abstracted and simple than actual dominos. Each tile is gained through a very simple draft, where your draft position on the next turn is determined by how good of a piece you take this turn. You’re trying to connect similar land types and collect crown symbols on your lands. It’s all a bit dull and dour and too simple, even for families. There’s not enough game here to be interesting. I’ve heard that the sequel, Queendomino, is a bit more complex and interesting, but I haven’t played it. It reminded me a lot of Isle of Skye, which is a significantly better game and also arguably family-level (maybe not smaller children). If you want a quick spacial puzzle game with individual tableaus consider that one instead. Or keep reading because I played a few of those. We played this Reiner Knizia design with the full 6 player count and I think that’s probably the way to go. This is a dirt-simple set collection card game with a press-your-luck mechanism as you’re flipping cards from a deck one at a time, but must take the most recent card you’ve revealed, plus up to two of the previous cards. We had a blast cheering and jeering people as they made poor card flipping decisions or got inexplicably lucky. As a party game I think it works well. With fewer people or with a more somber atmosphere it might be just okay. You’re collecting sets, and that’s about it. I’d consider picking this up at some point if I found it cheap. Check it out. Capital is very melancholy and Polish. It’s about trying to build and rebuild Warsaw as it keeps getting ravaged by war. You draft nice chunky square tiles with different building types on it and arrange them into a 4×3 grid. After each of the game’s 6 rounds you score points and get money based on the arrangement of your different neighborhoods. Money is very tight and I found myself trading in a tile for cash nearly every round. Drafting is legitimately difficult, trying to balance money for impact while considering what tiles you might be passing to your opponent. Holding everything in a 4×3 grid is tough and you will need to make sacrifices and hard tradeoffs. Fortunately you can build on top of tiles (even getting a discount equal to the price of the tile you’re covering up), but that carries with it its own set of tough decisions as you may be perfectly set up for a certain type of arrangement and need to completely rethink your long-term plans. I liked it. It’s like if you took Suburbia, simplified it, and took away all whimsy and replaced it with a grey-sky aesthetic and memories of World War II. It only took about 40 minutes for a 4 player game, so a good filler game for people who lean towards longer, heavier games, like me. This is like Codenames meets Spyfall, and it rates somewhere in between that masterpiece and stinker, respectively. You’ve got two teams like with Codenames, and the cluemasters are trying to get their team to guess a single word. They begin by writing down a secret clue for their team and then alternate giving public clues. The catch: after writing down a clue the other team can guess the answer. So they need to be both helpful and sufficiently vague so as to not lose the game. The game works great when the secret clues are different. But in practice in my 10 or so rounds that doesn’t happen much. For many of the words the secret clue is fairly obvious. However, a couple of the rounds were real nail-biters and in those I enjoyed it quite a bit. If you’re into word games or just want to mix it up and not play Codenames some time, this might be a good one to pick up. This was a huge 2017 hit, and I had been itching to play it. I just didn’t get the opportunity until Connclave. 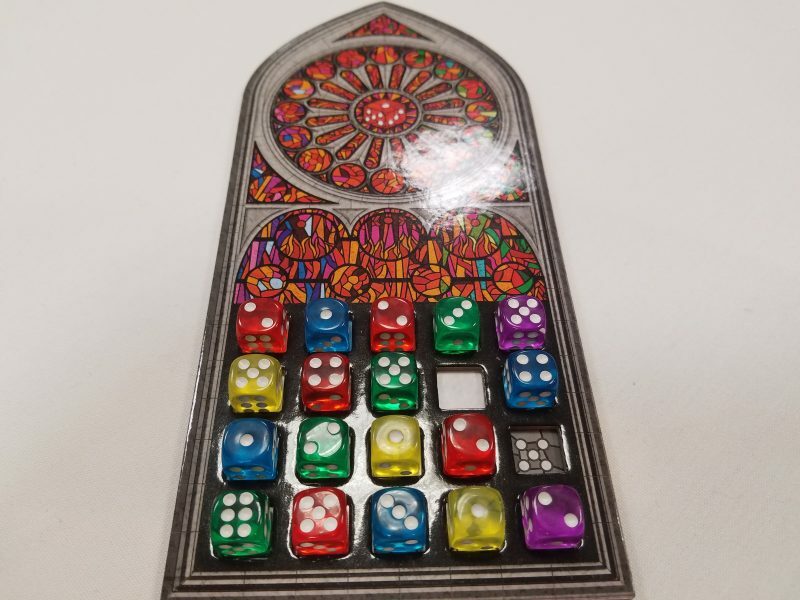 This is a dice-drafting spatial puzzle kind of game where you’re constructing stained-glass windows with colorful translucent dice. There are a number of placement restrictions and scoring is counted across both public and secret objectives that are selected randomly. There are also a number of special actions you can pay for to get a one time use ability. I don’t have much to say here other than that it’s a fine game with some interesting decisions and what appears to be a good amount of variable content. It’s also absolutely beautiful. I think it would be a great family game. 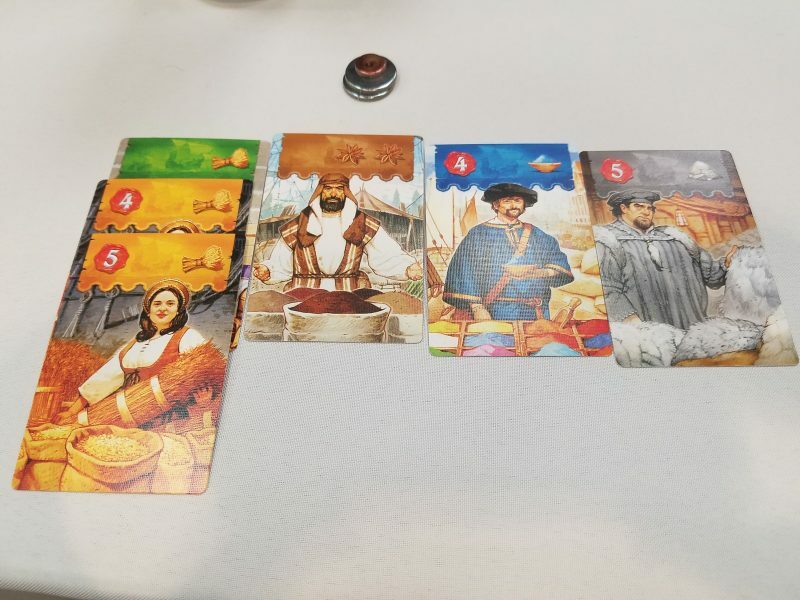 Apparently this game isn’t available in the US yet, so it was a treat to get to play board game hipster and experience Calimala before the rest of you all. It’s a mid-weight area control game with a few unique twists. Action selection is determined by placing a disc between two actions on the 3×3 action grid and taking both actions. If someone places their disc in that same spot, you then get to do the actions again after they do, so there’s a lot of really tough choices to be made if someone has a couple of discs in the same space and you want to do those actions. You would be giving them two free actions, but it might still be worth it. Maybe. Once three discs are in a spot, the fourth disc placed there will cause the bottom one to pop out and score the next item on the scoring track–so you’re scoring each of the area control spaces throughout the game, and players directly control when each one happens. That’s really neat and it made some really frustrating and interesting predicaments. The most interesting part of the game is the fact that the scoring track and the action spaces are completely randomized each game. Depending on how they’re arranged–especially the actions–the game can change dramatically. While this does create a ton of variable play, especially for what is otherwise a bone-dry cube-pushing euro, I’m concerned that the random action placement can create some game duds. The problem is that each of the “gather resource” action spaces pairs best with a certain “place resources” action space, so if they’re next to each other, the spot between them is clearly a better value than other spaces on the board. So everyone simply rushes to those spots, which fuels more value for having discs on that spot and creates a first player advantage. If you decide to go elsewhere you’re simply not going to be getting as many actions as other people. Usually there’s a benefit to doing what other people aren’t in a eurogame like this, but I don’t think that’s the case here. When there are a number of equally great or lame options this won’t be a problem, but if there’s only one good resource pair I’m afraid that the whole game will suffer from people piling up on it. It’s not quite as drastic as I’m making it out to be and I think Calimala is a good game. I just don’t know if it’s as brilliant as its mechanisms make it seem on first glance. Check it out if you get the chance, though. I’ve got a secret. Well it’s not really a secret because I’m about to tell you all about it. Before playing London I had never played a Martin Wallace game. I always assumed my first one would be a train game, but instead it’s the 2nd edition of this tableau building game about being a snobby rich person rebuilding the city of London. Poverty is your chief annoyance and paupers are your enemies. Solve that by throwing them in jail or creating sewer systems! You’re going to have to take loans, which have a steep 50% interest rate. You’ll be constructing things like….buildings. And neighborhoods. I don’t remember much because I was focusing on the effects of the cards. On your turn you’re going to be drawing a card and then usually playing some cards to your tableau. Cards cost money and also another card of the same color, so don’t get too attached to them. Fortunately the discards go to a display in the center of the table so if no one else likes the card you just threw away you may get a chance to draw it back up on your next turn. This center display also allows the players to determine the length of the game, because you can also draw from a draw pile. If the display fills up and people need to discard, rows are shuffled off to the side and removed from the game. It’s elegant and neat. So you’re building up your tableau with neat cards, but you can’t use any of them. To do that you need to activate your city, whereby you can activate everything in your tableau. Great! 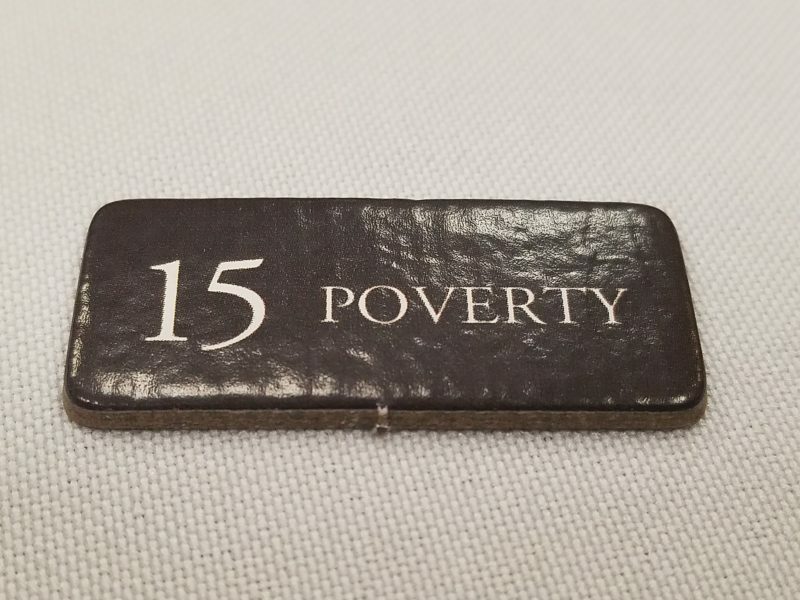 The problem is that you take a poverty token for every card in your hand and every card in your tableau. 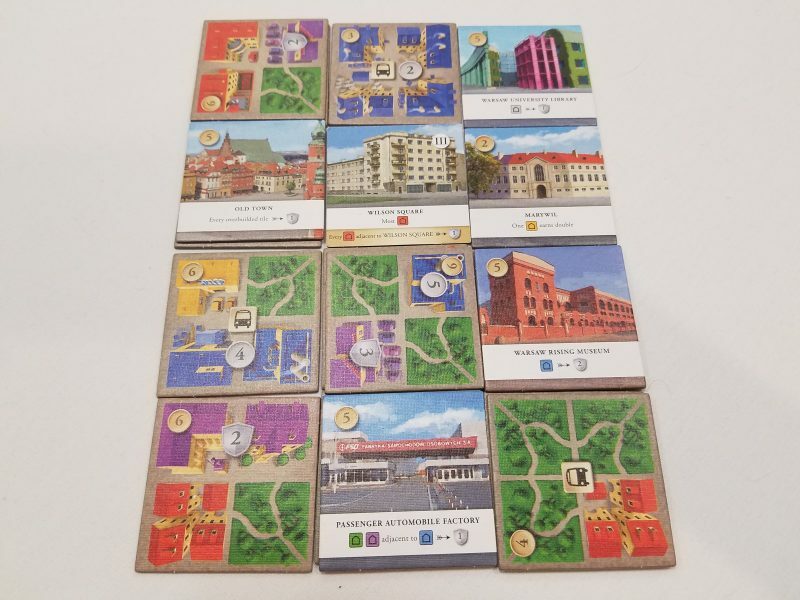 Activating a card usually causes them to flip over, and you can build new cards on top of them, but there’s a really tough choice there for how big you want your city to get. There are a few ways to reduce poverty but it’s an uphill battle. At the end of the game you can get hit with some nasty penalties for being more impoverished than other players, so you need to keep a close eye on how much they’re generating. It was a really fun first play, though because you go through all of the cards in each game I’m not sure how it will last in the long-run. Sometimes games like this can get more rich as you understand what’s out there and plan around it–in those cases the game transforms into something a lot more tactical and interactive. But it could just become dull and repetitive. I kind of want to get a copy and find out. Well there are the brand new games I played this weekend. All in all I enjoyed all of them a good amount except for Kingdomino, which was a fine design but not my cup of tea. Nothing blew my mind, but they were all intriguing. A few more games to put on the ol’ BGG wishlist and then try not to spend too much money on.